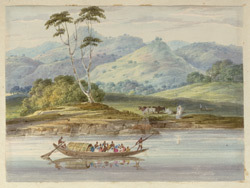 Watercolour by Sir Charles D'Oyly of a budgerow filled with people on the river near Udhua Nullah, Santal Parganas District, from an album in red leather covers with a gold stamped border, containing 28 water-colours of a trip along the Bhagirathi and Ganges Rivers, dated August to October 1820. The trip must have been to take up his new appointment as Opium Agent at Patna. Udhua Nullah, located in Bihar, was the site of the defeat of Nawab Mir Kasim of Bengal by Major Adams in 1763. Budgerows (or bazras) were passenger-carrying native cargo barges, half covered with a roof construction which has been described as resembling 'a haystack upon a barge'.